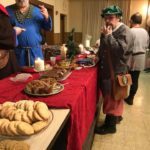 On December 20, the Barony of the Cleftlands celebrated the end of the month with a Tudor-themed Yule Revel. 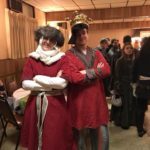 Our many members arrived in Tudor or other festive clothing to celebrate the many festivities in December. 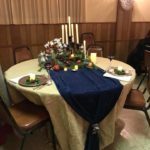 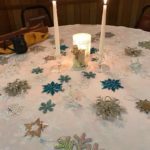 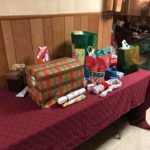 The snack table was laden with delicious treats, the white elephant gift exchange had many participants, and the table decorating contest afforded a lovely array of holiday scenery. 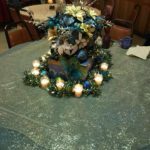 The first place winner was an amazing period entry from Duchess Runa and Lady Æthelwynn and second place to Lady Sarra Bossard for her gorgeous peacock themed table. 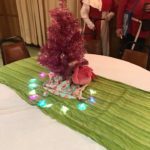 Special thanks to Lady Claricia for orchestrating the revel, Jan the Lord of Yule for being such a good sport judging the table decorating contest and assisting with the gift exchange, and to all of the decorators, cooks, and attendees who made this Yule a fantastic one! 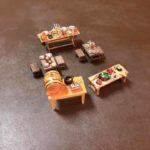 Photographs by Lady Claricia de la Mere.